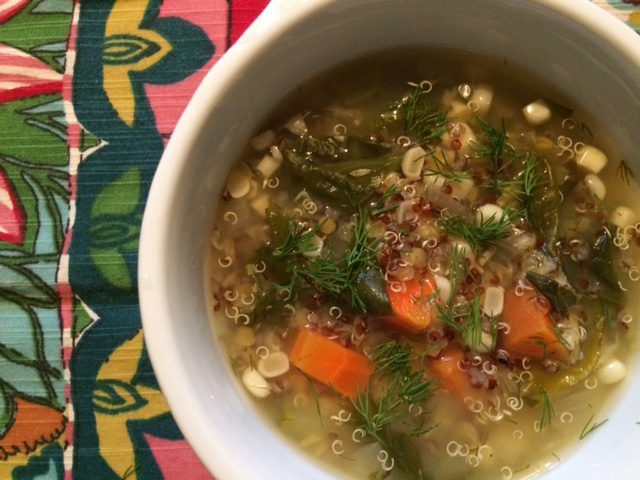 A delicious early spring soup perfect for the days when there is a slight chill in the air. The fresh corn, zucchini, dill and basil are a mouthwatering combination. Preheat a large pot to medium heat. Add the onion, garlic, diced carrot and celery. Sauté over for 5 mins with 2 tablespoons of water. Add additional water (1 tablespoon at a time) to the vegetables so they do not stick to the bottom of the pot. Add the veg stock, quinoa, red split lentils, zucchini and corn. Bring to a boil and simmer on low for about 15-20 minutes until the quinoa and vegetables are cooked. Add the spinach, dill, and basil. Taste and adjust seasoning as needed. Add salt and pepper to taste.